Ardmore is the county seat of Carter County. The community is located about 90 miles from Oklahoma City, Oklahoma and about 90 miles from the Dallas/Fort Worth area. It is a city of about 60,000 residents. On April 22, 1966, Ardmore was the site of the worst plane crash in Oklahoma history, which killed 83 people. Mr. Apple’s Cemetery is actually the Rose Hill Cemetery, which is also listed in places as St. Mary’s Cemetery. At any rate, Mr. Apple is interred in Ardmore, Oklahoma at a cemetery that is NOT called “Mr. Apple’s Cemetery”. 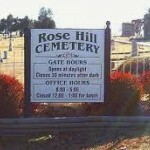 To get to St. Mary’s Cemetery/Rose Hill Cemetery/Mr. Apple’s Cemetery, take S. Commerce Street /Hwy 77 out of Ardmore, Oklahoma down to Highway 70. Go east on Highway 70 to Carter Ave. Turn north onto Carter Avenue and then turn, almost immediately onto Cemetery Road heading west/northwest. Local lore says that if you go to Mr. Apple’s Cemetery and find Mr. Apple’s mausoleum, that strange events will plague you if you walk around the mausoleum 3 times and say, “Mr. Apple are you home?” Folks report that after circumnavigating the mausoleum the allotted three times, that a bright light chased them and afterwards they found scratches on their neck. Apparently a number of people have reported receiving scratches on their neck and arms. They have also reported seeing apparitions near the mausoleum and strange lights and orbs in or near the mausoleum. They have also reported hearing disembodied footsteps that they couldn’t explain.